Thanks to J.C. for noticing this, Asus has just released a new drivers & utilities for Vista on R2H. 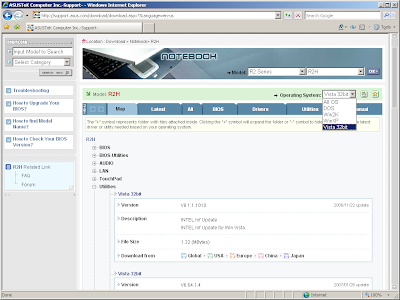 As you will notice in the Downloads page, now there is a Vista 32 bit entry in the operating system drop down box. I would recommend going through all categories, for example you will find the wi-fi driver in the Utilities section, probably because it is packaged along with the wi-fi utilities. - Ricoh card reader (maybe my Corsair SD 133x will working with ReadyBoost now?!). Dan Dar3: I am very thankful for your contribution that you have given in this blog to all the users of Asus R2H. Thanks for sharing your experiences and knowledges. Thanks J.C., I appreciate your thoughts! I’ll try to write in English the best I can to ask you for help, for all the people (like me) that don’t have the knowledge to do a clean upgrade from Windows Tablet PC to Windows Vista. In Windows Tablet PC that came with the R2H I tried to kill all the unnecessary process. I followed yours advice and I used for it the Systernals Autoruns utility but I think that I was not very well succeeded because I didn’t get an optimal result. So, I decided to wait for the Windows Vista from the Asus’s Upgrade Program to make a new try and then I evidenced that Vista drivers have became available at Asus download site and I thought that it is the right time to make the upgrade to Windows Vista because I think that the receive the DVD with Windows Vista is too delayed At this moment, I visited Asus’s support website again and I found a lot of driver’s and programs and I’m very confused. In resume: maybe you can help to all of us making a definitive tutorial of the upgrade process and what driver’s and programs you recommend in this procedure. I imagine that this project will be a hardly job and certainly you are a busy person. Please, don’t think that I’m a sluggish person. I’m only afraid to make a lot of mistakes and crashed the device with severity. I think that yours advice about the upgrade process will be helpful to all of us and this tutorial is only to facilitate the transition to Windows Vista. Your English is just fine - Engllsh is not my primary language either, and I understand you perfectly. What I should've specified from the begginig is that I installed Vista on a separate partition -I wanted to keep Windows XP working and I understand the upgrade process doesn't always work correctly. I will try to put together a detailed post with my experiences with installing Vista and please feel free to ask any questions. Thanks very much for the FTP link, I think I spotted a few Vista drivers I would try (audio, wireless, camera).